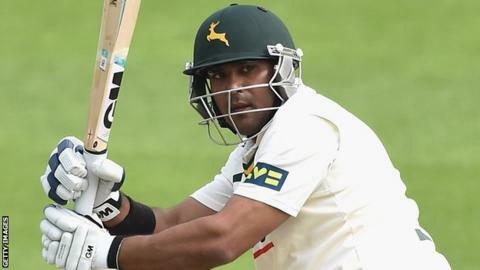 Samit Patel smashed an unbeaten century for Nottinghamshire as they put Somerset's bowlers to the sword. The 29-year-old finished on 116 not out, sharing an unbroken partnership of 188 with captain Chris Read (95 not out) as the visitors closed on 382-5. Phil Jaques (65) and James Taylor (60) also contributed, only Lewis Gregory (3-65) posing any threat for the hosts. Such was Nottinghamshire's dominance, Patel and Read scored 182 runs after tea at a rate of almost six an over. The last six County Championship matches between Somerset and Nottinghamshire have been drawn. Patel, who last played for England during their tour of India in January 2013, provided a timely reminder to the selectors, batting with aggression throughout his innings as he brought up his ton off just 129 balls (including 20 boundaries). Read batted with similar authority, hitting 17 fours in his 103-ball knock. It was a different story earlier in the day for the Somerset bowlers when Alfonso Thomas knocked Steven Mullaney leg stump out of the ground and Gregory had Michael Lumb caught by Alviro Petersen to leave Notts 45-2. Australian Jaques, who turned 35 on Saturday, and Taylor then rebuilt with a partnership of 112 before the in-form Gregory returned to the attack to remove both in quick succession - Jaques caught by James Hildreth and Taylor edging behind following a loose drive. The visitors were briefly tottering on 194-5 when Riki Wessels wafted outside his off stump to nick Jamie Overton to the wicket-keeper just before tea. But the evening session saw Patel and Read flay the toiling attack to all parts of the ground as they closed in on maximum batting points on a pitch which seemed to get flatter as they day wore on.